Harold Grant married Dorothy Louise Silvis, daughter of Thomas Sharp Silvis and Lina C. Kane. Married Name before 1937 As of before 1937,her married name was McCarville. Ella E. Kammerude was born circa 1911 at Wisconsin. She was the daughter of Peter P. Kammerude and Minnie (?). Ella E. Kammerude married Robert McCarville, son of James Joseph McCarville and Genevieve Wilson, before 1937. Ella E. Kammerude and Robert McCarville were divorced before 1940. [S373] U.S. Federal Census 1940 U.S. Federal Census, by Ancestry.com, Year: 1940; Census Place: Fayette, Lafayette, Wisconsin; Roll: T627_4492; Page: 8A; Enumeration District: 33-13. Name Variation Peter Jerome McCarville was also known as Jerry. Peter Jerome McCarville was born on 12 May 1937 at Lancaster, Grant, Wisconsin. He was the son of Robert McCarville and Ella E. Kammerude. Peter Jerome McCarville died on 29 November 2004 at age 67. Peter P. Kammerude married Minnie (?). Peter P. Kammerude was born circa 1879 at Norway. Married Name Her married name was Kammerude. Minnie (?) married Peter P. Kammerude. Minnie (?) was born circa 1884 at Wisconsin. Faith Ann Greenheck was the daughter of Cornelius Greenheck Jr. and Ruth Ann Richmond. Faith Ann Greenheck died before 2014. Raymond Stephen Volk was born on 28 April 1916 at Plain, Sauk, Wisconsin. He was the son of Leo Ralph Volk and Mina Meise. Raymond Stephen Volk died on 26 February 1996 at age 79. Adam Volk was born in 1852 at Germany. He was the son of (?) Volk. Adam Volk married Elizabeth Gelhaus, daughter of Arnold Gelhaus and Catherine Hugobach, on 24 April 1877 at Sauk, Wisconsin. Adam Volk died on 7 July 1891. [S246] U.S. Federal Census 1880 U.S. Federal Census, by Ancestry.com, Year: 1880; Census Place: Honey Creek, Sauk, Wisconsin; Roll: 1446; Page: 133C; Enumeration District: 253. Married Name 24 April 1877 As of 24 April 1877,her married name was Volk. Elizabeth Gelhaus was born on 15 July 1856 at Pennsylvania. She was the daughter of Arnold Gelhaus and Catherine Hugobach. Elizabeth Gelhaus married Adam Volk, son of (?) Volk, on 24 April 1877 at Sauk, Wisconsin. Elizabeth Gelhaus married Phillip Volk Sr., son of (?) Volk, in 1916. Elizabeth Gelhaus died on 5 July 1938 at Sauk, Wisconsin, at age 81. Elizabeth Gelhaus had 8 with 6 living in 1900 children. John Whittingham married Anna Marie Volk, daughter of Phillip Volk Sr. and Mary Zoerg. Married Name Her married name was Cramer. Elizabeth Volk married Jerry Cramer. Elizabeth Volk was born on 20 January 1879 at Plain, Sauk, Wisconsin. She was the daughter of Phillip Volk Sr. and Mary Zoerg. Elizabeth Volk died in 1960. [S246] U.S. Federal Census 1880 U.S. Federal Census, by Ancestry.com, Year: 1880; Census Place: Franklin, Sauk, Wisconsin; Roll: 1446; Family History Film: 1255446; Page: 104C; Enumeration District: 251; . Jerry Cramer married Elizabeth Volk, daughter of Phillip Volk Sr. and Mary Zoerg. Jerry Cramer was born circa 1873 at Wisconsin. Josephine Volk married William S. Cramer. Josephine Volk was born in 1881. Josephine Volk died in 1966. William S. Cramer married Josephine Volk, daughter of Phillip Volk Sr. and Mary Zoerg. Agnes Catherine Cramer was born on 1 October 1905 at Plain, Sauk, Wisconsin, also reported as 8 Oct 1905. She was the daughter of William S. Cramer and Josephine Volk. Agnes Catherine Cramer died on 6 November 1990 at age 85. Married Name Her married name was Booth. Catherine Elizabeth Lins married Roscoe Booth. Catherine Elizabeth Lins was born on 17 December 1911 at Wisconsin. She was the daughter of George Edward Lins and Catherine Volk. Catherine Elizabeth Lins died on 1 February 1994 at age 82. Edward George Lins was born on 21 March 1914 at Wisconsin. He was the son of George Edward Lins and Catherine Volk. Edward George Lins died on 26 October 1970 at age 56. Name Variation Almon Ward was also known as Al. Almon Ward married Maria Volk, daughter of Phillip Volk Sr. and Mary Zoerg. Almon Ward was born in 1905 at Madison, Dane, Wisconsin. He was the son of Almon Ward and Maria Volk. Henry Steffen was born circa 1879 at Wisconsin. He married Barbara Volk, daughter of Phillip Volk Sr. and Mary Zoerg, before 1905. Sebastian Theodore Kreul was born on 20 January 1882 at Wisconsin. 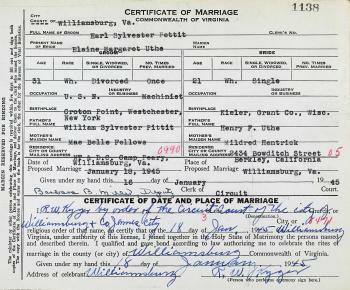 He married Barbara Volk, daughter of Phillip Volk Sr. and Mary Zoerg, circa 1909 at 2nd marriage for her; 1st for him. Angeline Cramer was born circa 1916 at Wisconsin. She was the daughter of Jerry Cramer and Elizabeth Volk. LeRoy Cramer was born circa 1900 at Wisconsin. He was the son of Jerry Cramer and Elizabeth Volk. Nickname Earl Sylvester Pettit also went by the name of Pete. Earl Sylvester Pettit was born in 1913. 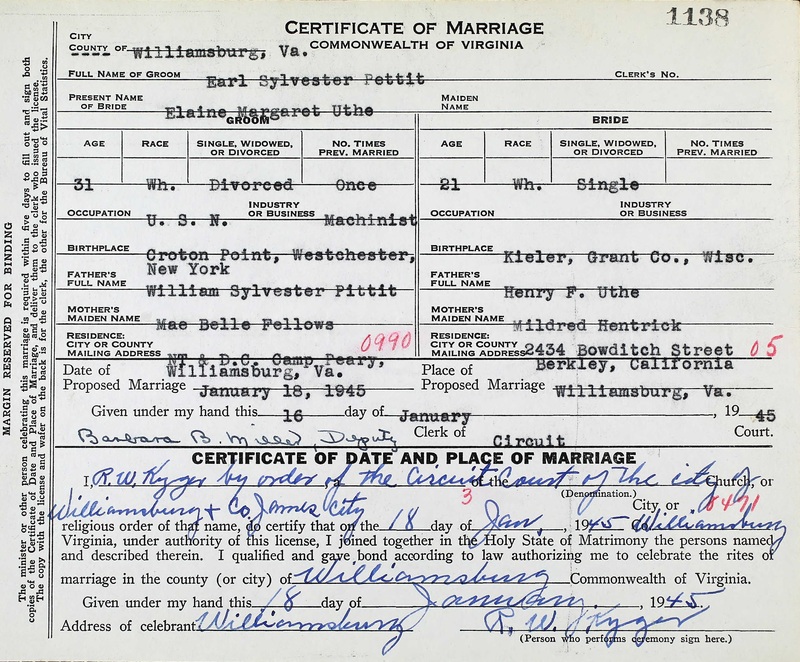 He married Elaine Margarette Uthe, daughter of Henry J. Uthe and Mildred Hentrich, on 18 January 1945 at Williamsburg, Virginia, Marriage certificate of Earl Sylvester Pettit and Elaine Margaret Uthe. Earl Sylvester Pettit was buried in 2004 at Saint Mary of the Snow Cemetery, Saugerties, Ulster, New York. Donald Joseph Brant was born on 1 June 1924 at Kieler, Grant, Wisconsin. He was the son of August Joseph Brant and Elizabeth A. Stohlmeyer. 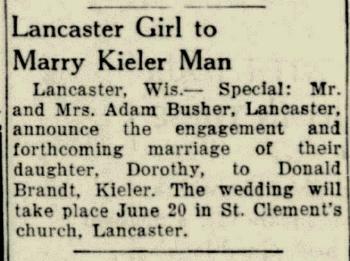 Donald Joseph Brant married Dorothy Busher, daughter of Adam Busher, on 20 June 1945 at Lancaster, Grant, Wisconsin, Dorothy Busher and Donald Brandt engagement announcement. Donald Joseph Brant died on 4 June 2000 at age 76. Married Name 20 June 1945 As of 20 June 1945,her married name was Brant. Dorothy Busher was born before 1927. She was the daughter of Adam Busher. Dorothy Busher married Donald Joseph Brant, son of August Joseph Brant and Elizabeth A. Stohlmeyer, on 20 June 1945 at Lancaster, Grant, Wisconsin, Dorothy Busher and Donald Brandt engagement announcement. Dorothy Busher died on 13 September 1994. Harold J. Brant was born circa 1922 at Wisconsin. Harold J. Brant died before 2000. Charles Brant was born circa 1933 at Wisconsin. Charles Brant died before 2000. Vincent Joseph Brant was born on 16 December 1930 at Potosi, Grant, Wisconsin. Vincent Joseph Brant married Alberta (?) on 22 October 1982. Vincent Joseph Brant died on 15 September 1999 at age 68.